Like a lion on a gazelle, the holidays are officially upon us. I don’t know about you ladies, but usually around two weeks in I am nostalgic for Easter or Halloween, any other holiday that doesn’t require me to make approximately nine thousand seven hundred sixty-eight decisions. Like what type of lights to string, white, or a color, or colors? And if colors what type of colors and what bulb size for that matter? Dad likes the retro large bulbs of his childhood but your youngest likes the small twinkling ones that are only found in the fifth Target you try. And what to get that one kid who is ambivalent about what gift he wants until approximately 10:32pm on Christmas Eve. Stressed yet? Well don’t be, because we have you covered on at least two of those decisions. First up is this year’s holiday punch, the drink not the thing you refrain from doing when someone cuts in the gift wrapping line. Historically, there are few things more ubiquitous in a Christmas gathering than a good punch. I myself have often dreamt of a traditional Dickensian themed Christmas complete with figgy pudding and an authentic Dickensian punch. Well here’s the thing, I’m probably not about to spend two days making a dessert and I am certain that serving Great Aunt Joan rum and brandy would be a terrible idea. So instead, I have for you a Christmas punch and it is delish, healthful, easy, and everyone can enjoy, even the kids. As a bonus, when we made this, the smell was heavenly. One of the easiest things you will make this season but also one of the most healthful. By adding Ningxia you add some delicious notes in one step like plum, aronia, cherry, blueberry, and pomegranate. But, most importantly you’ve slipped in superfoods, these are all antioxidants! In addition, Ningxia red has pure vanilla extract and Lemon, Orange, Yuzu, and Tangerine essential oils. How many holiday punches have you had that includes all that? So, instead of Aunt Joan getting tipsy and inappropriate, you’ve given her a mega health boost. One decision out of the way! Combine all ingredients in pitcher or punch bowl and mix. To make even more tasty, use frozen pineapple and orange cubes! Second on my list but first in my heart is a holiday martini. It is a perfect drink to serve when getting the girls together and having a baking or gift-wrapping session. This one is great because even that one annoying friend who actually watches her caloric intake can partake. We all have one and she looks great even this time of year while everyone else is bloated from all the shocking holiday food crimes, usually involving obscene amounts of fudge and regret. You can tell your obnoxiously thigh-gapped friend that you’ve used healthfully conscious ingredients like Prairie organic, gluten-free vodka. This company is pretty cool and the way they describe the care that’s put into the quality of their products is impressive to say the least. If I am going to mix something with my precious Young Living oils, it better be good. And I dig their description of the vodka, “hints of melon and pear on the nose, creamy on the palate, bright and smooth at the finish.” Uh yum. This perfectly compliments Young Living’s Citrus Fresh Vitality and Lime Vitality essential oils that we added. I love love love the energizing and uplifting Citrus Fresh blend, it includes Orange, Tangerine, Grapefruit, Lemon, and Mandarin oils with a hint of Spearmint. This martini is crisp, fresh, and not overly sweet, unlike just about everything this time of year. A couple of these and the empty gift-wrapping tubes (also known fencing swords in our house) are sure to start swinging. Simply add ingredients to a cocktail shaker with ice, shake like Shakira for ten seconds. Pour into two glasses and garnish. Finally, like all good girlfriends, we are going to give you some unwarranted advice that you might first brush off initially, but as the sugar cookies and cheesy canned dough rings continue to assault you every social function this season, you will see our advice came from a place of love and experience. 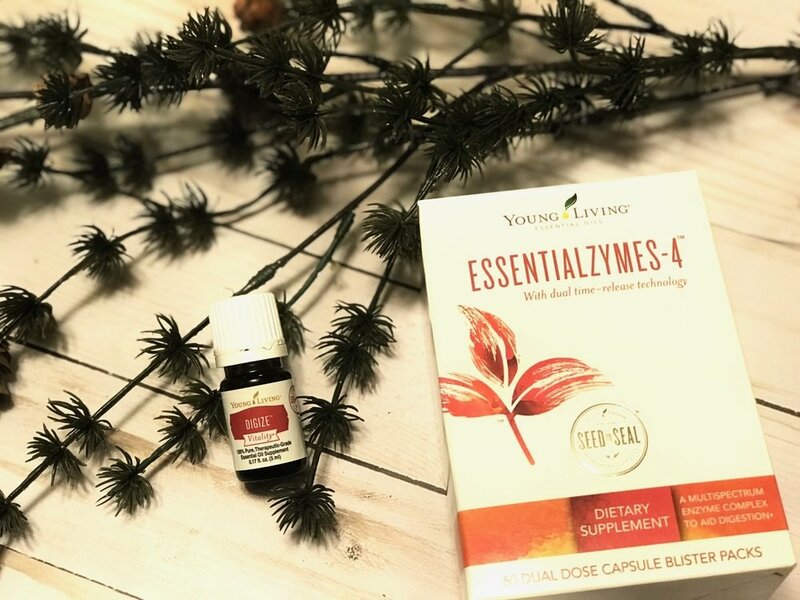 I’m talking Young Living’s Digize Vitality blend and Essentialzymes-4. First Digize, this little number was an unexpected rockstar out of Young Living’s starter kit. I honestly ignored this guy for a good six months after receiving my kit, and oh my lands, how foolish. It packs in eight essential oils, peppermint, patchouli, juniper, ginger, fennel, tarragon, anise and lemongrass. Digize is good for after meals, and there are numerous ways to ingest, gel-capsules, with a spoonful of honey, or with water, infused with other oils or not. Personally, I am desperate when I hit up Digize and drink it down the hatch quickly with water because I’m over whatever digestive issues I might have going on. Try it, you’re welcome. Whoa. Key words here, digestion, modern processed diet, optimal nutrient absorption. Putting it simply, Essentialzymes-4 includes several types of enzymes (remember high-school biology anyone) to break down and aid in the digestion of various types of nutrition. And of course, it includes some old reliable and helpful friends such as Fennel, Tarragon, Rosemary, Ginger, and Lemongrass essential oils. Again, you’re welcome. Now that you’ve crossed some holiday issues off your list, remember to stop, breathe, and take time to take care of yourself. We here at Serendipitous Living hope that this post helps you do just that. Happy Holidays and Seasons Greetings from Serendipitous Living!